While Samsung certainly mastered the glamorous Apple-esque launch event, when it debuted the Galaxy S3 this month, its attempt at 'one more thing' fell a little flat. Whereas Steve Jobs' legendary final announcements included the iPod touch and MacBook AIr, Samsung got us all excited only to announce a host of new Mobile PIN retail outlets across London. Once we all figured out what a Mobile PIN actually was - and to be honest, it wasn't immediately clear - we didn't quite feel compelled to indulge in some Jobsnote-style whooping and hollering. Makeshift shops where we could buy the Samsung Galaxy S3? Cue polite applause. 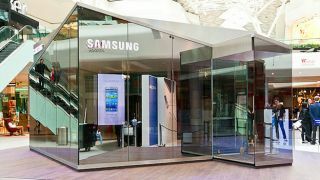 Regardless of that grievous letdown, the pop-up shops, which will also stock a selection of flagship Samsung Mobile products, are appearing across London and will open on May 29, before the device goes on sale across the nation. More stores will be announced as time goes on.